Heat oven to 180C/160C fan. For the topping, beat the butter and sugar together until creamy. Spread over the base and a quarter of the way up the sides of a 20-21cm round cake tin. 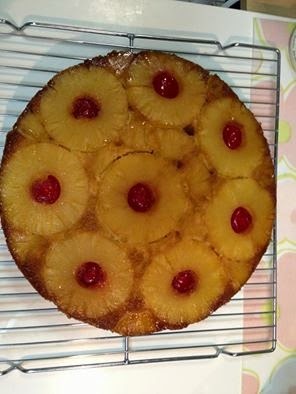 Arrange pineapple rings on top, then place cherries in the centres of the rings.